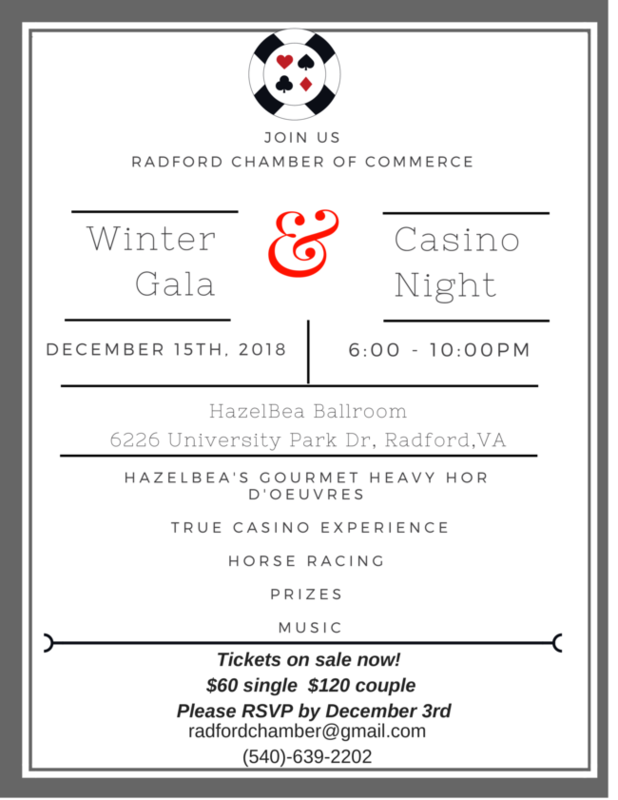 Radford City Chamber of Commerce presents the 2018 Winter Gala & Casino Night on Saturday, December 15, 2018 at the HazelBea Ballroom in Radford, VA. Enjoy a true casino experience with heavy hor d'oeuvres provided by Hazelbea Catering, horse racing, prizes and music. Note: Gambling is just for fun and not for real money. Individual tickets are $60.00 and couple tickets are $110.00. To purchase tickets online, visit: http://www.radfordchamber.com/wintergala2018. Please RSVP by Monday, December 10, 2018. To view the event flyer, visit: https://i.imgur.com/Gj5IEGB.png. HazelBea Catering is located at 6226 University Park Drive in Radford, VA.
For questions, contact the Radford Chamber at 540-639-2202 or email RadfordChamber@gmail.com. For more information, visit: http://www.radfordchamber.com/event/http-www-radfordchamber-com-p5497 or https://www.facebook.com/RadfordChamberofCommerce/.